Leona Johanna Franke (nee Brandenburger), 91, of Belleville, died Jan. 17, 2019, at Freeburg Care Center, surrounded by her family. She was born Jan. 22, 1927, in Smithton, daughter of the late Walter and Marguerite Brandenburger (nee Hammel). She married Wilbur R. Franke on May 21, 1947; he preceded her in death on July 15, 2016. Mrs. Franke worked at Century Electric Co. She was a former beautician and was co-owner and operator of Franke Brake Service along with her husband. 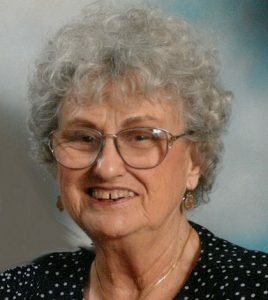 She was a member of Trinity United Church of Christ for many years. She was a member of the American Business Women’s Club, the Modern Woodmen Club and was very active with the Jefferson Grade School Mother’s Club. She loved bowling, sewing, gardening, dancing and working with stained glass. She is survived by her son, Daniel (Pamela) Franke of Belleville; daughter, Judith Woods of Belleville; six grandchildren, Jason Turpin, SaraH Milford, Dustin Franke, Dawn Franke, Dana Harris and Tyler Franke; and 12 great-grandchildren. She was preceded in death by her husband, parents, brother Melvin Brandenburger, brothers-in-law Leroy Franke and Orville Koerber and sisters-in-law Eileen Brandenburger, Marie Koerber and Verida Franke. Visitation is 4 to 8 p.m. Jan. 20, and 10-11 a.m. Jan. 21, at George Renner & Sons Funeral Home, Belleville. Funeral services will be at 11 a.m. Jan. 21, at the funeral home, Rev. Cory Hartz officiating. Interment will follow at Lake View Memorial Gardens, Fairview Heights. Arrangements were handled by George Renner & Sons Funeral Home, Belleville. Memorials may be made to the Alzheimer’s Association or to Trinity United Church of Christ, Belleville.